I went to D.C.H.Springs yesterday and wanted to warn persons about the road. If you go be expected to wash their car/truck when you get home. The snow covers the road half way to the Bowen ranch from where the pavement ends. The thick patches of ice start at the 90 degree turn that is the Rock Springs ranch. Going up some of the hills I could see where others had spun their tires. In the places where there are puddles there are big pieces of ice when I drove past at noon Friday. I was glad to have my 4 wheel drive. It was mostly sunny yesterday at the springs. I could not see any car parked at the Bowen ranch. There was 4 vehicles at the freedom trail parking area. 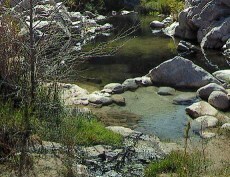 While at the springs I took the temperature of the Creek water just up stream from the Arizona pool it was 38 degrees. That is a 7 degree drop from when I took it last week. The Arizona Pool was 104 degrees and just a little over 1 foot deep. The outside air temp was 41 degrees. I brought a trash bag to take trash from the springs but, some one had collected it before me. As I could not find any trash.There were only @ 12 persons at the springs at one time. I drank 2 beers and fergot to take temps at the other pools. Yesterday was a very good day ! As I made it up Mofo hill the Sheriffs Dept helicopter made 2 circles of the springs. Before heading toward the spillway. He made me feel safe. As I watched him I wondered how much that cost ?? ?